In a time when your average smartphone can capture immersive 360-degree photos using a clever app, how can consumers justify spending $600 on a spherical camera that does the same thing? It turns out they can’t, which is why the creators of the Panono have filed for bankruptcy, and are in the process of selling off the company’s assets. We first brought news of the Panono, then called the Throwable Panoramic Ball Camera, back in October of 2011 when researchers at the Technische Universität in Berlin, led by Jonas Pfeil, first showed off their creation. The ball featured 32 two-megapixel cellphone camera modules arranged in a spherical layout that would simultaneously snap and stitch together a 360-degree panoramic photo when sensors in the thrown ball detected it had reached its apogee. It was a clever use of existing technologies to automate the creation of panoramic photos, and after showing their ball camera at Siggraph Asia 2011 a few months later, there was enough buzz around the product for its creators to further develop it into a consumer-ready product. 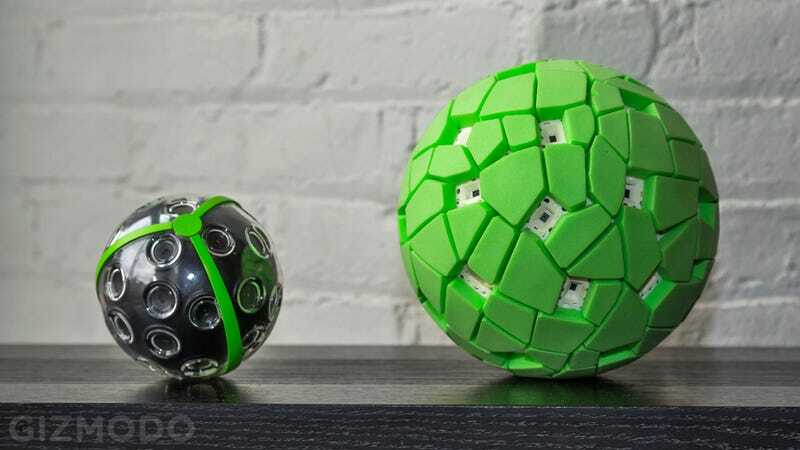 Two years later, in November of 2013, Gizmodo got a chance to try a redesigned version of the ball cam, now called the Panono, which was being made available to consumers through an Indiegogo crowdfunding campaign looking to raise $900,000 to facilitate production. The redesigned Panono made it easy to snap monstrous 72-megapixel, 360-degree panoramic shots that were automatically offloaded to a smartphone app for viewing, but $600 for a pre-order seemed steep for a camera with very specific functionality. Despite the steep price tag, the Panono’s Indiegogo campaign successfully raised $1,250,028, and in 2016, five years after the camera originally hit our radar, the first units started shipping to backers and reviewers. But by 2016, 360-degree panoramic photos were far easier to capture using smartphone apps, or simpler and cheaper dedicated devices like Ricoh’s Theta cameras. While still easy to use, getting good results from the Panono ball camera required the right conditions and practiced techniques, and having to send images to the company’s servers to be properly stitched proved to be a data hog if you weren’t connected to a wi-fi network. The consumer-ready version of the Panono simply wasn’t as polished as it needed to be to justify its $600 price—or its existence in 2016—and despite a successful crowdfunding campaign, only around 400 of the cameras were shipped to backers, according to DPReview. In May the company officially filed for bankruptcy, and in a recent letter to Indiegogo backers, reported by DPReview, the company’s co-founder, Jonas Pfeil, confirmed that the sale of the company’s assets was in the process of being finalized. Details about who exactly is buying Panono’s assets, including hardware and IP rights, weren’t revealed, but Pfeil explained that the money from the sale was only being used to pay off the company’s existing debts, and that the buyer would have no obligations to external parties. In other words, if you backed the Panono hardware on Indiegogo and haven’t yet received your camera, you probably never will. But if you did get one, the company’s image stitching servers will still be left operational. Unfortunately, the Panono website has no mention of the company’s bankruptcy, and appears to still be selling the ball cameras for a staggering $2,400+. If only 400 Panonos were shipped to the 2,608 backers who pre-ordered via Indiegogo what’s the deal with the “in stock” cameras the company is still offering on its website. The Panono was an undeniably fun idea, and we’re sorry to see it go after all of these years. That said, this is as good a reminder as any that a great idea does not a consumer product make. The risks involved with backing a crowdfunded product don’t magically disappear when funding goals are reached. Unexpected delays and costs are a common occurrence with product development, even for established companies who’ve been through the process countless times. The talented creators of the Panono had a fully-functional product before launching their Indiegogo campaign, but were still unable to overcome production hurdles to deliver it to consumers. Crowdfunding a product puts nearly all of the risk on the consumer, and given success stories from Kickstarter and Indiegogo have been few and far between, the risk just doesn’t seem worth it anymore. We reached out to Jonas Pfeil via the email we have on file, and we’ll update if we hear back. Update, 8:25am ET: A press release provided to Gizmodo this morning reveals that Bryanston Group AG, a Swiss-based private equity firm, is the secret investor who acquired all of Panano’s trademarks, patents, and other assets. The business will be restarted under a new holding company called Professional360 GmbH which will be based in Berlin. Professional360 GmbH will not only continue to operate the cloud servers required for the existing Panono camera to work, it also plans to release new products and features in the coming year. We will continue creating and innovating the best 360-degree cameras together with a state-of-the-art platform for our users. In fact, we are planning to release new products and software services within the next months already. The transition from Panono GmbH to Professional360 GmbH will not be affecting the current users, as the brand and the website will not change, and we will continue to operate the existing platform. Finally, while all legal liabilities remain with the old Panono GmbH and its management, we as Professional360 GmbH feel morally obliged to find a solution that all early supporters of the Panono technology will be able to enjoy the camera as soon as possible after so many years of waiting. You’ll note the new company is also looking into ways to finally deliver product to those who backed Panono’s Indiegogo campaign, as well as customers who pre-ordered the camera via the website but never received their camera. Specific details about this are still forthcoming. We will continue to update this story as we know more.